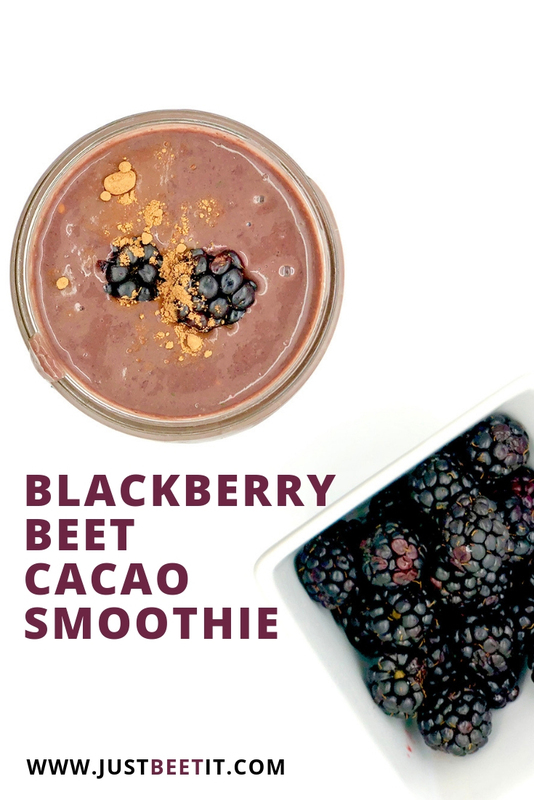 Increase endurance and boost your mood with a decadently delicious Beet, Blackberry, and Raw Cacao Smoothie. The combination of beets (enhance cardiovascular function), blackberries (high in vitamin C), and raw cacao (potent antioxidants) creates a powerhouse of nutrients. Additionally, this smoothie offers about 8 grams of plant protein (raw almond butter) and heart-healthy unsaturated fats providing necessary sustainable energy during a workout. This is one of my favorite go-to smoothies before lengthy weight-lifting sessions. Raw cacao is made by cold-pressing un-roasted cacao beans. Cocoa may look like cacao, but it is not the same. Cocoa powder is raw cacao that has been roasted at high temperatures which can change the molecular structure of the cacao bean reducing its overall nutritional value. Although cocoa contains many nutritional benefits, raw cacao is more nutrient dense. It’s nutritious AND super tasty, so adding more raw cacao to your diet is a win win situation. What are the Health Benefits of Raw Cacao? Cacao is also a stellar mood enhancer, as it can increase certain nerutransmitters promoting a sense of well-being. "The same brain chemical that is released when we experience deep feelings of love – phenylethylamine – is found in chocolate" (Food Matters). And who doesn't want to feel more in love? Cheers! 1. Gently wash the beetroot and beet greens, detaching greens from root. If not using beet greens, add greens of your choice, such as kale, spinach, or chard. Save beet stems to add to soups or create a Quick-Pickled Beet Stems side-dish. 2. Peel beetroot and cut in cubes or quarters. 3. In a high-speed blender, add all ingredients. Pulse until smooth. If using frozen fruit, smoothie will be chilled. Add ice if using fresh fruit and you prefer a chilled smoothie. Enjoy!